India's toy trains are small trains that run on historic mountain railway lines, built by the British in the late 19th century and early 20th century to provide access to their hill settlements. Although these trains are slow and can take up to 8 hours to reach their destinations, the scenery is beautiful, making the journeys really worthwhile. Three of the mountain railways -- the Kalka-Shimla Railway, Nilgiri Mountain Railway, and Darjeeling Himalayan Railway -- have been recognized as UNESCO World Heritage Sites as they are outstanding living examples of enterprising engineering solutions. 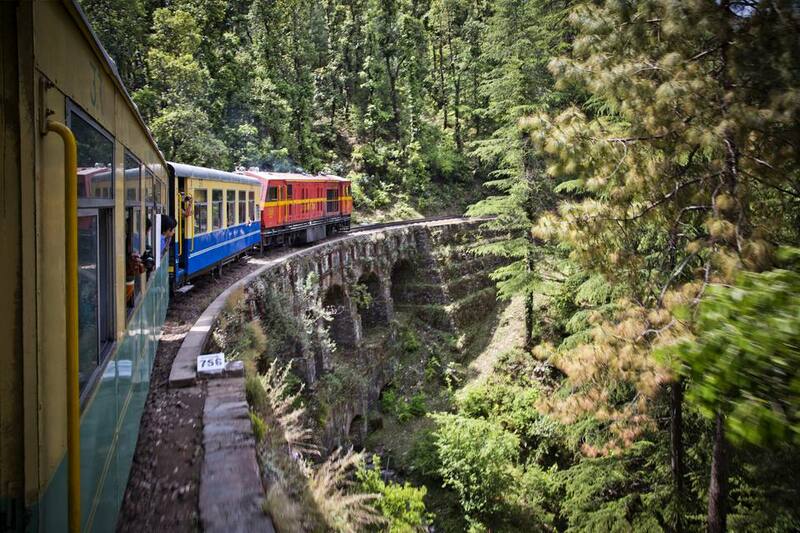 The historic Kalka-Shimla toy train is a popular way of reaching Shimla, which was once the summer capital of British rulers. The railway was completed in 1903 and provides one of the most picturesque train journeys in India. It runs for 96 kilometers (60 miles) though 20 railway stations, 103 tunnels, 800 bridges, and an incredible 900 curves! The entire trip all the way from Kalka, near Chandigarh, takes about 5 hours. However, many people prefer to travel only from Barog, as this is where the longest tunnel and most spectacular scenery occurs. It's a steep climb with plenty of fascinating sightseeing along the way. The Darjeeling toy train, officially known as the Darjeeling Himalayan Railway, is the oldest of India's historic mountain railways. Completed in 1881, it transports passengers through the lower reaches of the Eastern Himalayas to the rolling hills and lush green tea plantations of Darjeeling. The train route runs for 80 kilometers (50 miles) from New Jalpaiguri, in the state of West Bengal, to Darjeeling via Siliguri, Kurseong, and Ghoom. It passes over five major, and nearly 500 minor, bridges. If you don't have a day spare to undertake the trip, two hour joy rides from Darjeeling to Ghoom are popular. At an altitude of 7,400 feet above sea level, Ghoom is the highest point on the route. The railway line climbs up steeply through a number of fascinating reverses and loops. One of the most scenic of these is Batasia Loop, between Ghoom and Darjeeling, which provides a panoramic view of Darjeeling perched on the hill and Mount Kanchenjunga in the background. The toy train that runs on the Nilgiri Mountain Railway is the highlight of a visit to the hill station of Ooty, which was established by the British as the summer headquarters of their government in Madras (Chennai). Although the railway was proposed in 1854, it wasn't completed until 1908 as rocky terrain and thickly forested hills made the work difficult. The 46 kilometer (28.5 mile) track runs from Metupalaiyam to Oorty via Coonoor, and passes over 250 bridges (including 32 major ones) and through 16 tunnels. The best views are situated along the stretch from Metupalaiyam to Coonoor. Hence, some people just travel along this stretch and then get off to enjoy the tea plantations at Coonoor. Tony Waltham / robertharding/Getty Images. The lesser-known Matheran toy train had its first run in 1907. It deposits passengers amid the shady greenery of the peaceful, pollution-free hill settlement of Matheran -- where all vehicles are banned, even bicycles. The journey starts at Neral, about halfway between Mumbai and Pune. Although the track is only 20 kilometers (12 miles) long, the train takes two and a half hours to reach the top of the hill as it has to slowly crawl up in a zigzag manner. The Kangra Valley Railway, completed in 1929, was the last mountain railway to be built. Its lengthy track extends for 164 kilometers (102 miles) from Pathankot in Punjab to Joginder Nagar in Himachal Pradesh, via Kangra (near Dharamsala) and Palampur. Unlike many other of India's mountain railways, it only has two tunnels as engineers avoided boring through the hillside. The entire journey takes about 10 hours. However, most of the scenic beauty comes after Kangra and extends beyond Palampur, as the train passes by villages and lush farmlands, with uninterrupted views of the impressive Dhauladhar mountain range. It's a memorable local experience! The stretch between Baijnath (where there's an ancient Shiva temple) and Joginder Nagar is the steepest, with Ahuj being the highest point at 1,290 meters (4,230 feet) above sea level. The popular paragliding destination Bir-Billing is nearby. Do note that the trains currently operating on this route are unreserved passenger trains. Timetables can be found here.